I’m so frustrated. I thought, “That’s the 12th homeless person I’ve walked by today on my three block walk into work.” What the heck? I reminded myself that I’m looking at the cycle of poverty and education systems (or lack thereof) that support these adults. “How do we break this cycle?” It seems overwhelming at times. Then, I learned about celebrity Chef Ivan Flowers. Maybe it was a fire and “creative differences” that caused Chef Flowers to leave Top of the Market, San Diego in late 2015. Likely, it wasn’t. Chef Flowers has begun to use his culinary ninja skills to break the cycle and change lives. We were fortunate to catch up with Chef Flowers’ director of PR, Tracy Phillips, to learn about what helps Chef Flowers do good, better. Use your career for good. Hard skill training can be used to teach soft skills. Relationships and mentoring have a greater impact. Serve your community with your passion. After the fire at Top of the Market, Executive Chef Ivan Flowers had a choice. He could join another restaurant or find a new path. For those who haven’t been in a commercial kitchen, it’s often a place where folks who have had a tough time in life end up. Chef Flowers, having ran some of the most successful restaurants in Arizona and San Diego, knew this too well. Rather than starting the next big restaurant, he decided to dedicate himself to improving lives for those who needed a second chance. Kitchens for Good breaks the cycles of food waste, poverty, and hunger through innovative programs in workforce training, healthy food production, and social enterprise. And Chef Flowers was tapped to run the Culinary Jobs Training Program. This program targets the following demographic: parolees and at risk foster youth. Parolees face an unemployment rate of 70-80%, and high levels of recidivism. From ages 18-24, foster youth experience unemployment at rates of 40%. Though these folks need to learn how to use a knife or sauté mushrooms vs. spinach, they often need to be trained basic life skills. Culinary training goes from knife skills, to sauté skills, to soft skills such as arriving on time, job site cleanliness, and temper control. Though twelve people work at the nonprofit Kitchens for Good, Chef Flowers works mostly with Katrina Meredith, Career Coach at Kitchens for Good. Though the culinary program is under a year old, the Culinary Job training program is off to a great start. Former students are coming back to say hello. Why? Because of mentorship. Relationships that Chef Ivan and the team cultivate with the students last longer than the program. And, they want to report their success. By going to training with Chef Flowers, 90% of his students get a job in a kitchen after attending their first class. Additionally, Chef Flowers is infusing his students with goodness and creating long term impact. The Culinary Students — as part of their on-site job training — volunteer to prepare meals for the homeless at Heaven’s Window, allowing them to easily give back, too. Chef Flowers is solely responsible for the Curriculum and builds his kitchen training in a way that transcends the program and impacts life. 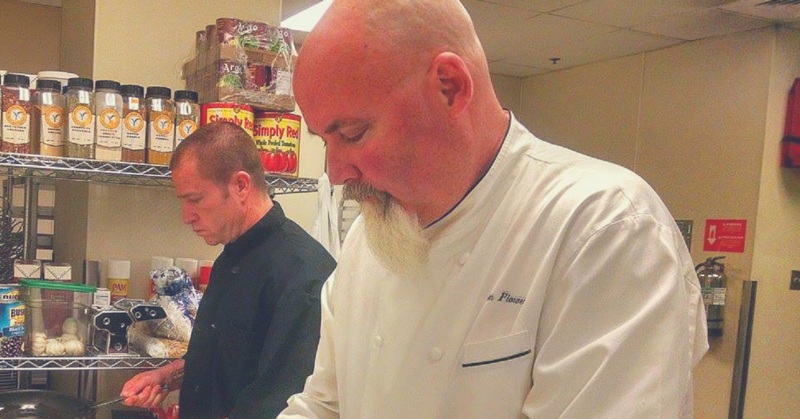 Chef Flowers uses his passion, the kitchen, to impact those less fortunate, unlucky, or in need of a second chance. And for Chef Flowers, the kitchen is a tool to do this. Whatever you’re passionate about can be a tool to help someone. Look where you live, where you work and do something. How can you utilize your passion and experience to give back?